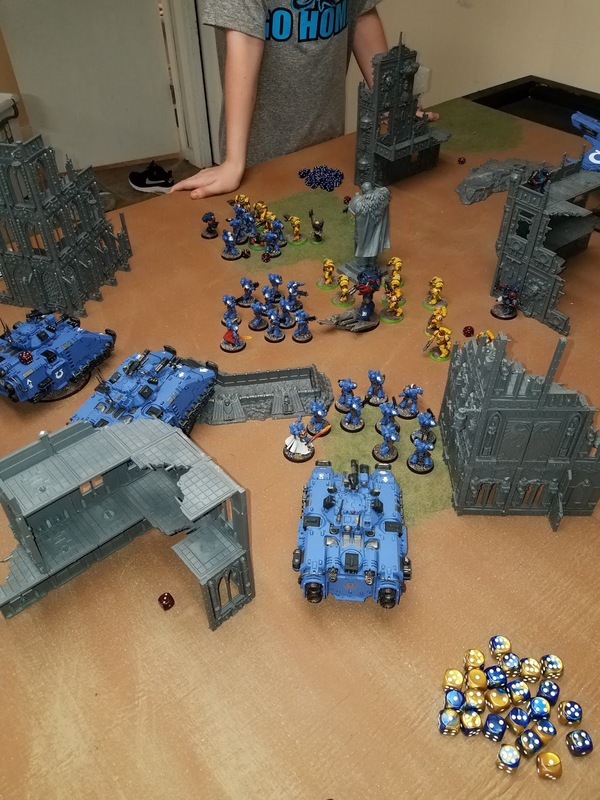 Father/Son battle report - Ultramarines versus Crimson/Imperial Fists - 2k points. 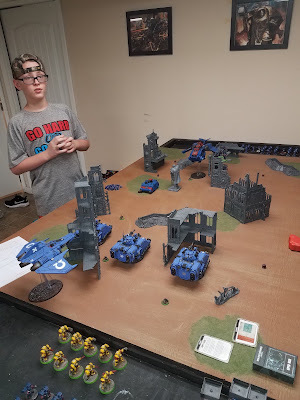 So the son and I decided to throw down a larger game (well for him at least) today. 2000 point lists, played on our table in the basement, with lists built by us. I decided to just use my 2k point Ultramarine Primaris Force, and he wanted to get a chance to play with some new units I just painted up for him - namely, a 10 man Assault Squad, some Cataphractii Terminators, and a Contemptor dread. He picked out the units that he used, with the only caveat being that they were fully painted/based. We deployed the 6 objective markers and then rolled to determine deployment zone. Gerrit won the roll for choice and chose Player B deployment. 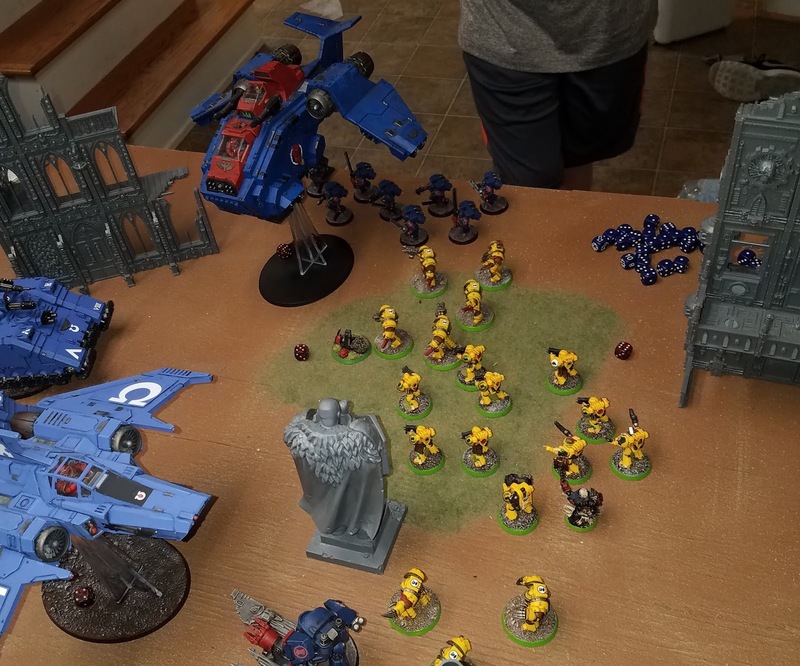 He chose to keep his 2 Cataphractii units and Assault marines in reserve, and deployed one tactical squad and the Contemptor in the Stormraven. He combat squaded his other Tactical Squad, deploying the missile launcher and 4 marines, along with the Gravis Captain in one tower, and the sergeant, meltagunner, 3 marines and the Chaplain in the Razorback. 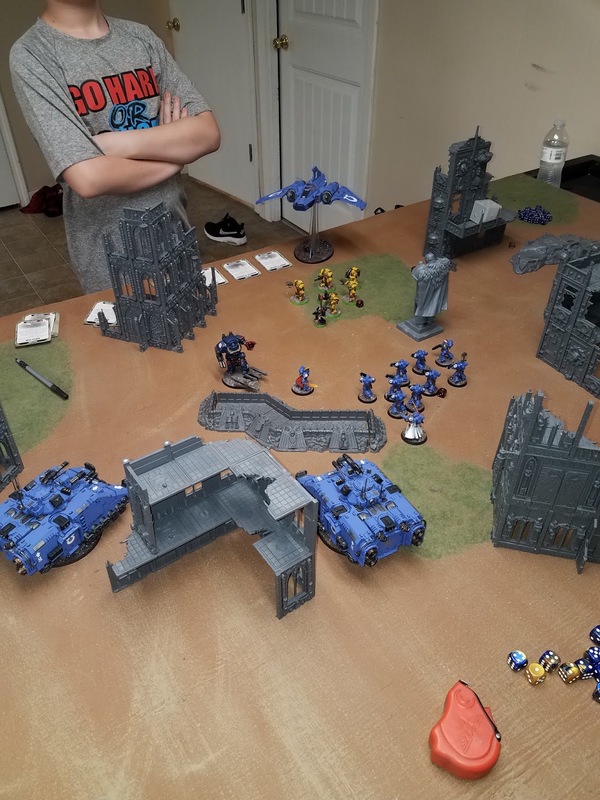 His Intercessor squad and Primaris Lieutenant deployed way forward in the deployment zone. Most units were poised to jump on objectives, to attempt to discover the cache quickly. I deployed to the front of my zone with all three Repulsors, embarking all squads and characters. The Apothecary rode with the Hellblasters, and the Lieutenant and Librarian rode with Intercessor squads. We determine that his Battalion granted him 6 CP, and I explained how these worked. My Patrol detachment netted me 3, so I would be saving those for critical re-rolls. I won the roll for first turn, and we started our game. Top of my turn, I barged all three Repulsors forward and zipped the Xiphon forward to attempt to deal with the StormRaven. I was able to get a combined 4 wounds on the StormRaven with the combined twin 8 lascannon shots from the Repulsors and Xiphon, as well as the Xiphon missile battery. With the weight of fire of Onslaught/Heavy Onslaught cannons from all one Repulsor, I reduced the combat squaded tactical squad to just the missile launcher marine. The combined weight of 2 Repulsors worth of Onslaught/Heavy Onslaught cannons from the other two made quick work of the Razorback, but the resulting explosion resulted in his 5 man combat squad getting wiped off the board. First Blood to DAD! Top of his turn, be dropped the other tactical squad and Contemptor and moved them up towards objectives to determine where it was. He used deepstrike to deploy the 2 Cataphractii units and the Assault squad, and then sped the StormRaven on a flanking maneuver to try to take out the Xiphon. Between the StormRaven and his Contemptor, and timely use of the Flakk Missile Strategem, Gerrit quickly laid some serious hurt on the Xiphon, totally 8 wounds in a single turn of shooting. His ranged Cataphractii unit discovered the objective, and now he had to sit on it until bottom of turn 5 to win the game. His Cataphractii ranged unit got off some lucky shots at the farmost Repulsor, resulting in a wound and his Assault Squad overcharged their pistols, causing 4 more, but killing off one of their own. 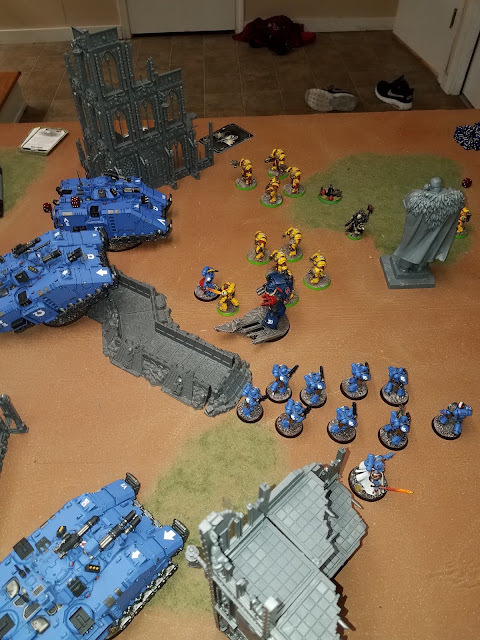 I started off turn 2 by deploying my Primaris Marines from the Repulsors, and moving the Repulsors back. His squads pack a ton of hurt in melee, and I was not ready to deal with losing my weight of fire. The Hellblasters directed their fury at the StormRaven, reducing a further 5 wounds, totalling 9. I used the Xiphon, to put more wounds on it, but it hung around, flitting by with 3 wounds. 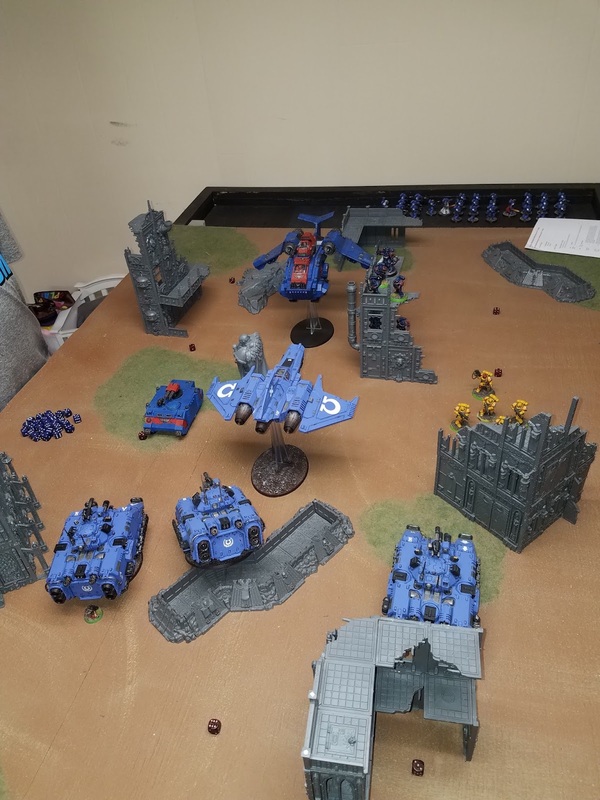 I used the weight of fire from the 2 of the repulsors to pummel that assault squad, and then used the twin las to finally plink the last few wounds off the StormRaven. The Intercessors with the Librarian cursed him for forgetting the words to the Smite spell, and turned their fire on the 5 man Intercessor squad, removing a model. The other Intercessor squad spat death at the full strength tactical squad, and was rewarded with 3 casualties. Gerrit moved his Chaplain up, to make sure that both Catphractii units could take full advantage of the Litanies of Hate. 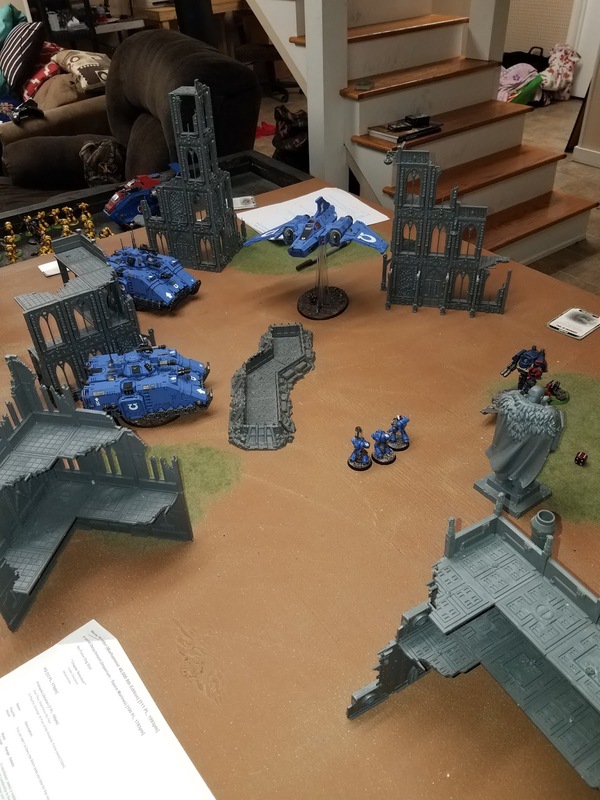 His Gravis Captain caame down off his perch to attempt to fortify the Intercessor squad being harried by their blue counterparts. Powerfist Cataphractii Terminators and the lone Assault Sergeant converged on the hated Hellblasters, pouring fire with combi-bolter and bolt pistol alike, bring down a full half of the squad thanks to my poor rolling. His Cataphractii ranged squad roared their fury and charged headlong into the Hellblaster squad, and crushed them to pulp, while the assault sergeant showed the Apothecary how to properly smite a foe, and crushed him where he stood. His assault Cataphractii unit and Intercessors charged the Ultramarine Lieutenant's Intercessor Squad, and Ancient Kickassimus, the Contemptor dread waded in, much to the chagrin of the Lieutenant. Although the Ultramarine Intercessor squad was quickly dispatched, the Lieutenant answered by slaying all but the Sergeant of the Imperial Fists Intercessor squad. Things were still looking good for the boys in blue. I turned the Xiphon back up field, and prepared to lay the hurt on the Contemptor, if I could just get it out of combat. The Cataphractii Assault Squad and Contemptor were taking a horrible toll on my foot troops, so they needed to be dealt with. 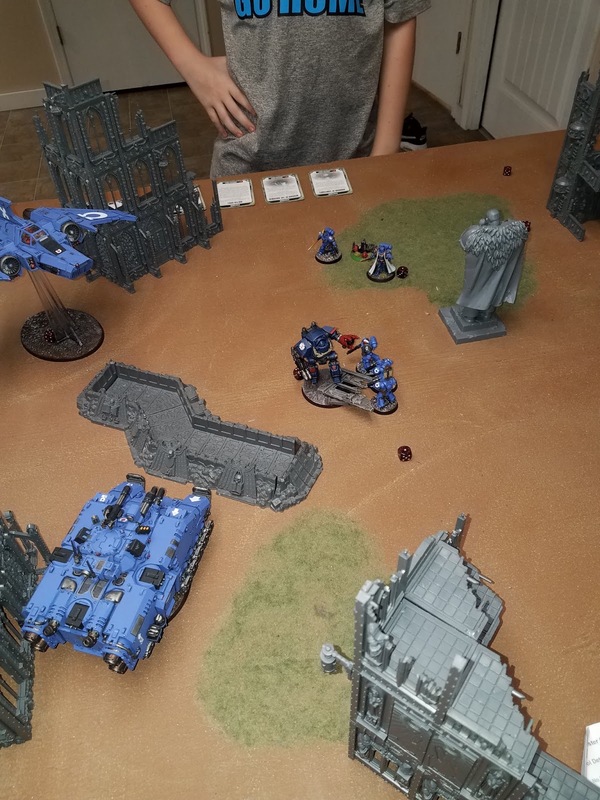 The librarian was finally able to remember his spells, and used Psychic Scourge and Fury of the Ancients to put some wounds on the Gravis Captain, who was then rapid fired by the Intercessor squad. I poured fire with onslaught and heavy onslaught alike, and the insane powerful shots from the Xiphon, but the danged Cataphractii and Contemptor are just hard nuts to crack. Atomantic invulnerable saves are a pain!!!! I was finally able to remove the last 3 tactical marines, reducing my sons anti tank capability to the Contemptor and melee. Finishing off the Fight phase, his Lightning claw terminators and contemptor wrecked the unit of Intercessors, leaving the Ultramarines Lieutenant to carve through the last of the Imperial Fists intercessors. Gerrit's turn saw lots of action! His ranged and melee Cataphractii moved up, and engaged a Repulsor at point blank range. Due to some great rolling (and Lieutenant allowing re-rolls of 1s), as well as some poor rolling on his part, the Repulsor took out all but 1 lightning claw Cataphractii on overwatch, while the ranged Cataphractii and Contemptor Dread engaged it and removed the last of it's wounds, resulting in a spectactular explosion that took the last of his melee Cataphractii off the board. His ranged cataphractii, after destroying the Repulsor, backed off to attempt to move back to the objective. I had 2 turns left to stop him from holding the objective, and that Dread would not DIE!. The Cataphractii parked on the objective, coupled with the Chaplain, meant that I needed to deal with them at range if possible, and then try to push him off the objective, or, at a minimum, contest it. The Lieutenant and Chaplain advanced on the objective and the Catphractii, and I threw Smite and Psychic Scourge at his chaplain, removing him in a puff of aetheric agony. I moved the remaining intercessors up to engage the Cataphractii, and poured all the fire into them that I couldm reducing them to 2 models. The Repulsors onslaught/Heavy onslaught cannons did the trick of removing the last 2 terminators, while the twin lascannons and xiphon missile battery peeled a few more wounds off the dread, reducing it to just 4 wounds remaining, which I felt my Intercessors could more than take care of. I declared my charge and rushed in, but the Contemptor peeled off an intercessor with some fantastic rolling on the dread. Once engaged, I failed to wound it at all, however, the Contemptor hammered at my squad, reducing it to 3 models. At this point, the boy was losing heart, so we discussed his options to try to pull off a win. I advised him that he could retreat his dread from combat, and try to get it to within range of the objective, which I firmly had 2 models parked on. He opted to do this, and moved his Dread back out of combat to get away from the Intercessors. As this would not allow him to charge or shoot this turn, it quickly ended. At this point, I knew that I had to get rid of that dread, but it was being stubborn. He had removed himself from combat, had 4 wounds remaining, and it was being stubborn. 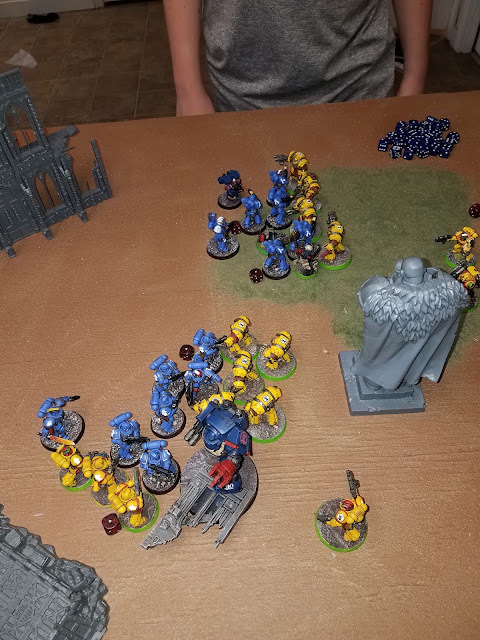 I left my models where they were, knowing that if I engaged him in melee again, he would destroy my last 3 intercessors, so I opted to try to shoot him down, both with psychic and ranged fire. Of course, my rolls, even with burning my last CP to re-roll, were terrible, resulting in 2 failed attempts for Smite and Scourge. Shooting produced nothing, as the Dice god of 1 seemed to be grinning at me like an idiot. My son made the most fantastic 4+ invulnerable rolls that I think if he hadn't been rolling in plain site, I would never have believed it. My turn ended with me knowing he was going to win the game, and I was okay with it. That dread moved up, shot the crap out of the Lieutenant, and killed him on the spot, and he quickly declared a charge on the librarian, who failed to hit with his paltry bolt pistol, so was quickly and thoroughly smooshed by a very angry Power Fist. So here, at the end of the game, sat a most triumphant Contemptor Dread, and a very happy son and dad. All in all a very tough game for him, but a real good learning experience. At the middle of turn 4 he was ready to give up and I helped him along with the game because I knew he could win. In the end, we had a Contemptor with 4 wounds remaining, sitting at the top of the stack. I did tell him that next time, we would work harder on his list and build one around Lysander so that he could field the units that he loves and have a good time with it. Terminators of all kinds, Centurions, Contemptor Dread, and his StormRaven and StormHawk (I have to build and paint that yet). 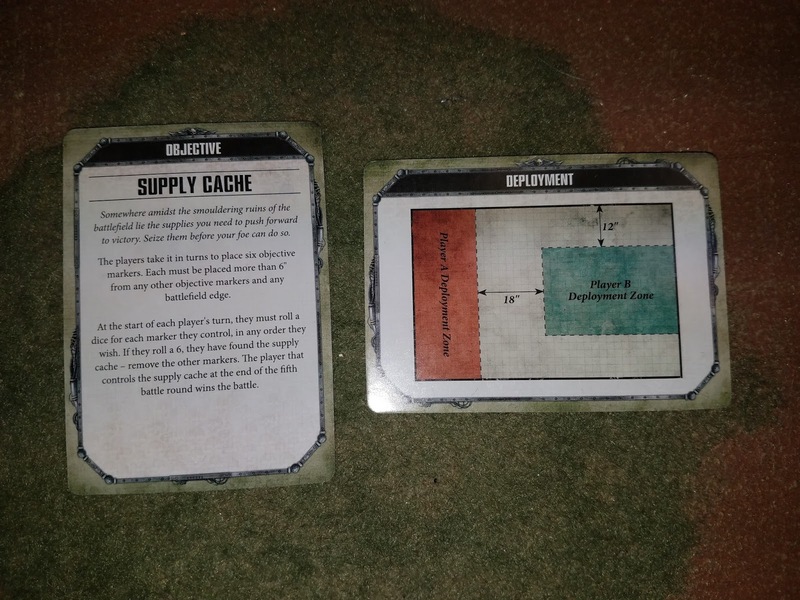 We did not draw tactical objective cards as we were playing a game with a sudden death scenario, as drawn from the open play deck. We did not use twists or anything further than scenario and deployment. We both forgot about warlord traits, and we both had to remind each other of Command Points and Strategems that we could employ. I used mine for strictly re-rolls, but with 6 CP to use, he made good use of the other strategems, especially flakk missiles to almost bring the Xiphon down. Don't give me crap about the unpainted terrain. I plan to get some work in on that next week. Last turn I did move the Xiphon, but it ended up being in the way for good pictures to show his victory, so we moved it back. Hope you all enjoyed reading as much as we did playing!